The University of Wisconsin is hosting a tutorial on how to make your own Organic Light Emitting Diodes. This is so amazingly awesome. We want you guys to make some. Someone make your own matrix and display some patterns on it and submit it. Please. Though we’ve seen lots of uses for OLED screens, we never really delved into the process of creating them. It looks much less complicated than we would have imagined. Looks messy.. I like it. Now this is neat! In the video they say moisture will affect the lifetime of the OLEDs. Anyone have any idea what the lifetime of these are? Can the lifetime be extended by sealing using, perhaps, silicone spray and epoxy or similar items? It would be nice to be able to make custom OLED displays for projects. Cool! I’m gonna run down to Walmart right now and get me some [Ru(bpy)3](BF4)2 polyvinylalcohol solution. I’ll let you know how it comes out. Piece of cake. I got some indium-tin oxide glass and [Ru(bpy)3](BF4)2 polyvinylalcohol in my junk drawer, right next to the duct tape. Here’s some surplus ITO glass. That is pretty cool, but I’m pretty sure I can’t go down to the local wal*mart (or whatever store you prefer) and pick up these materials. Yeah those projects that require a lab and lab materials are always so out there, interesting but not practical. And sure you might find a supplier but I bet it’s such a hassle and rising cost for a bit of glow that it won’t make that much sense, but hey if you are the type that doesn’t mind the bother and gets thrilled why not? In the materials section, they give a company from which you can purchase conductive glass. You could also likely go with a clear conductive substrate other than glass, such as metallized mylar which you can purchase in the gift wrapping aisle or camping aisle of your local *mart. The mirror finish of the metallized mylar camping blanket can be removed in places where you would like light to shine through using rubbing alcohol and a q-tip (and the cheaper blankets aren’t totally opaque to begin with.) Never tried this with metallized mylar gift ribbon, so YMMV. Another option would be to use conductive ink on glass or plastic. Everything like the ITO glass etc seems easy to get hold of..however, the [Ru(bpy)3](BF4)2 polyvinylalcohol isn’t particularly easy to get hold of, i.e. it needs to be synthesised, so you need to befriend your friendly local chemistry students to see if they can synthesise some. so you probably can not get [Ru(bpy)3](BF4)2 PVA at a *mart. they offer a synth page; only the RuCl3 3H2O may be hard to get because of the price ($600+ for 10 grams). Obtainable at your local phone repair shop for not much $, I got a bag of used screens etc for £20 while over in the UK. interestingly if you “split” a used LCD and carefully rinse off the liquid crystals with nail polish remover the front already has vertical pathways ready for making matrix displays. the oleds themselves can be a pain to get, although one of my chemistry buddies seem to think gutting a new yellow or red lightstick might be a cheap way to get something that could be converted into OLED material with a bit of chemistry. Hey, at least I already have the conductive glass. The chemicals, not so much. thats pretty cool, but i doubt it lasts long. Looks like the ruthenium’s gonna cost a pretty penny. Yea, super cool. 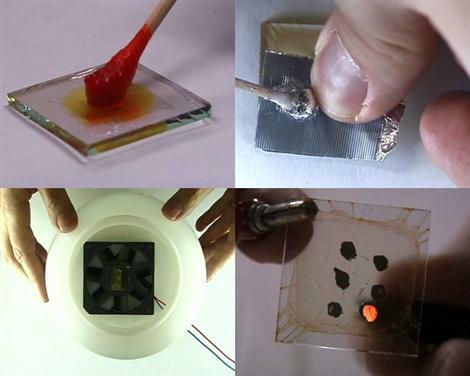 Now we need an LED we can make with materials at home. This reminds me of something I heard a while back. Someone told me that their roommate used to work for sony (or something like that) in LCD/plasma screen manufacture and he said that they’re really cheap and easy to make. Like, $50 and a trip to walmart/home depot could get you a decent 20″ screen. He sounded serious but I honestly don’t know if his old roommate was BSing him and he bought it. For reasons I’d rather not get into on here, I can’t go back and ask questions so I really don’t know if this was serious. I wish I could say more but that’s all I have. The “process” was relayed to me by someone who didn’t understand it and wasn’t really paying attention so I cant say what he would use or how it works. Does anybody at least think this is plausible? I looked into this but it’s a little over my head..
I’ve seen this before. I’d like to see this more refined or maybe a way to print actual pixels displays at home. can i just plug a pickle into the wall? i’ts organic, it’s light emitting, but if i make it a diode then it will be a 60hz pickle strobe OLED right? Great! Now if only a howto of how to make a liquid crystal display were posted my life would be complete. i built a “homemade” LED display using selected SiC (silicon carbide) crystals, conductive thread and low melting point alloy. Works well but is tedious to find glowing spots. also looked into synthesizing 6H SiC using a high voltage water plasma process but this is unlikely to work.. maybe someone can try it? the plan is to set up an arc under sodium metasilicate (NaSiO3) in water next to a pyrolytic graphite sheet and some of the silicon *might* fuse to the aligned carbon on the freshly peeled surface of the PG. Take a look at E2M Technology http://www.e2mtechnology.co.uk/plasticelectronics for OLED kits. They have everything that you need in easy to use liquids. then there is the new scientist “ice fabrication” method, which involves a supercooled plate, ice and an electron beam. i am working on a slightly simpler version based on using a bluray laser and peltier (to cool the pcb etc down to -10C) with a thin layer of inkjet ink to act as the resist.